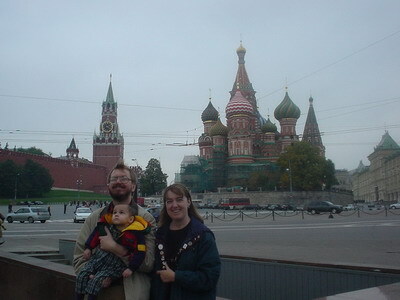 Steve, Cathy, and Nicholas -- Nicholas the traveler, part 1 (created 2009-02-15). Nicholas has always been a very good traveler. 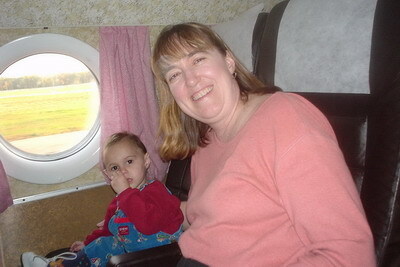 He was adopted from Russia, so as a two year old, he got to experience a lot more traveling than many adults. 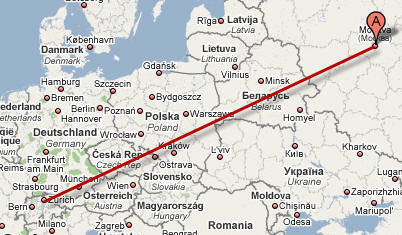 His first flight, from Kaliningrad to Moscow, went very smoothly. Here's a picture of him on the airplane. He amused himself during the flight with an apple and a plastic knife and carved an elaborate apple structure. There was a substantial amount of paperwork to be done in Moscow. On the last full day in Moscow, our driver stopped to let us get a picture in front of Moscow's most famous landmark, St. Basil's Cathedral. This is one of our favorite pictures. 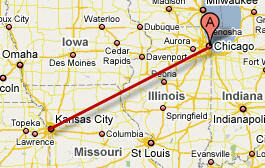 and from Chicago to Kansas City. As a mathematician, I have to note that the actual path that the jets took was not the linear path noted here, but a great circle that appears typically as an arc on most flat maps. I am not sophisticated enough to draw arcs on a map but the transatlantic flight, for example, crossed Scotland, Iceland, and the tip of Greenland before heading across Canada for Chicago. Nicholas behaved extremely well for most of the flight. 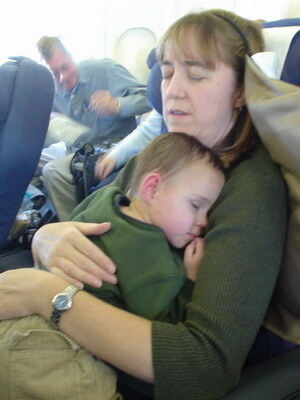 Here's a picture of Nicholas and Cathy during the trans-Atlantic part of the flight. Cathy doesn't remember me taking this picture. 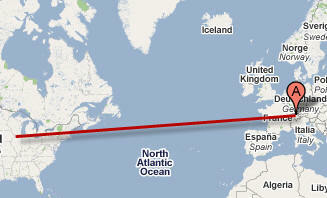 The Chicago to Kansas City leg was the shortest part of the flight, but it was not much fun for Nicholas. He had figured out at the start of the flight how to unbuckle his seat belt, and couldn't understand why we wouldn't let him roam at will around the plane. Unfortunately, the ride was bumpy enough that the pilot never was able to remove the "Fasten Seatbelt" sign. Since that time, Nicholas has been on many flights to many fun locations (which I'll try to talk about in future entries), but nothing could compare to his first two flights.